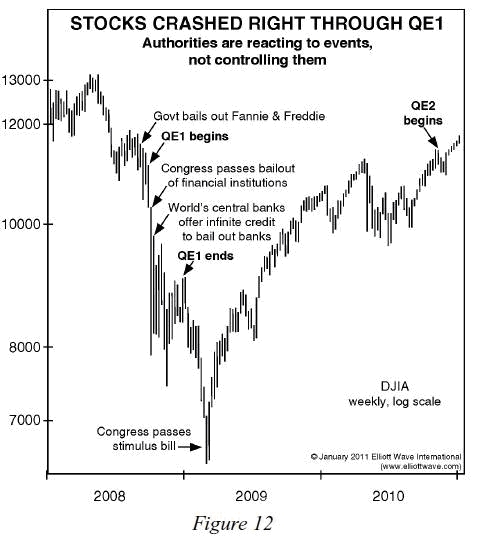 What Will Happen to the Stock Market When QE2 Ends? The second round of the Federal Reserve’s quantitative easing program, better known as QE2, will expire this week. The QE2 policy was officially announced on November 4, 2010, and has been widely credited with subsequent stock market gains. And now, according to rumors, the end of this "experimental" program will kill the stock rally — with potential impact across all markets. For starters, there is little "experimental" about QE2. As EWI’s November 2010 Elliott Wave Financial Forecast pointed out to subscribers, "In Japan, the very same remedy the U.S. is applying today — rate cuts followed by quantitative easing — finds its stock market still down more than 75% from its December 1989 peak." But investors have short memories. And even many of those who remember how powerless the Fed was during the 2007-2009 crash are convinced that "it’s different this time." What do the facts and the evidence say? Read the expanded, 2011 edition of our popular free Club EWI resource, The Independent Investor eBook. From the very first pages, the charts and graphs will show you that the Fed’s QE programs are far less powerful than is commonly presumed. Why interest rates don’t drive stock prices. Why rising oil prices are not bearish for stocks. Why earnings don’t drive stock prices. Why the problem with the Fed is its very existence. Why central banks don’t control the markets. Keep reading this free report now — all you need is a free Club EWI membership. This article was syndicated by Elliott Wave International and was originally published under the headline What Will Happen to the Stock Market When QE2 Ends?. EWI is the world’s largest market forecasting firm. Its staff of full-time analysts led by Chartered Market Technician Robert Prechter provides 24-hour-a-day market analysis to institutional and private investors around the world.